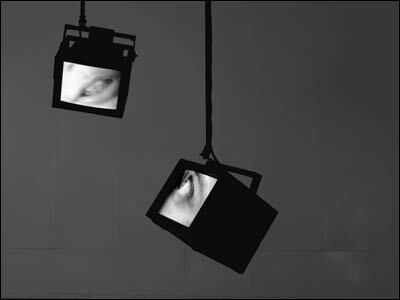 The installation is based on sound- and video-recordings (eye and mouth) of a one-year old child, whose sounds can still, though only just, be described as unstructured. The child is in the state of development just before it starts to form words. The essentially chaotic sound-experiments of the child, are grouped and ordered in the installation. The monitor above alternately shows the child's eye and mouth. The other monitor shows eye and mouth of the adult reacting to the sounds of the child and imitating them. There is a constant interaction of visual contact and interplay by means of sound. The young child as a linguistic researcher operates seemingly without a target, starting from zero. Rhetorica examines the development of language in an early stage and puts the childish uninhibited experiment next to a grown-up, well thought out, reflection on this.